Casseroles with pineapple...messy breakfasts...and other things Over the Top! When my friend and fellow lush Dani from Cooking for my Peace of Mind made this crazy dish...I knew it wouldn't be long before I tried it. At first glance, the combination of ingredients seem odd...like they wouldn't go together. But the more you think about it, the harder the thoughts of sweet n' savory slap you in the face...try me...try me...I gave in. Funny though, I don't really like canned pineapple. Never have liked canned pineapple. I can eat fresh pineapple until I'm sticky and slippery like a babe in a highchair...but canned pineapple just tastes weird to me. I made it anyway. 1 can (20 oz)pineapple chunks, drained 1 can (20 oz)crushed pineapple, drained 5 Tbs. 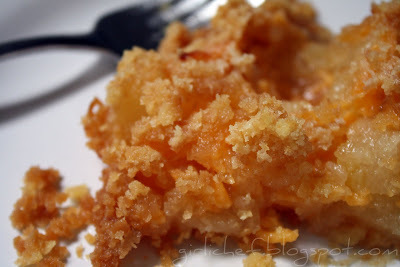 flour 1 c. sugar 1 1/2 - 2 cups sharp cheddar cheese, shredded 1 1/2 cups Ritz cracker crumbs 1 stick butter (1/2 c.), melted Preheat your oven to 350 degrees F. Grease a small casserole dish (I used an 8x8). 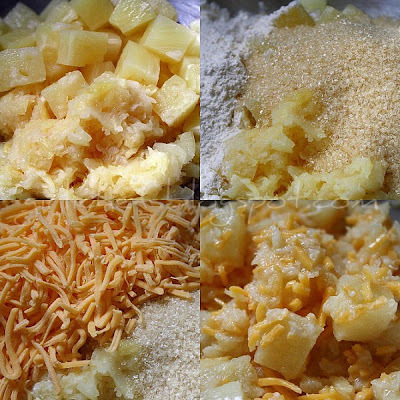 Combine the pineapple, sugar, flour and cheese in a large bowl. Pour into the casserole dish. 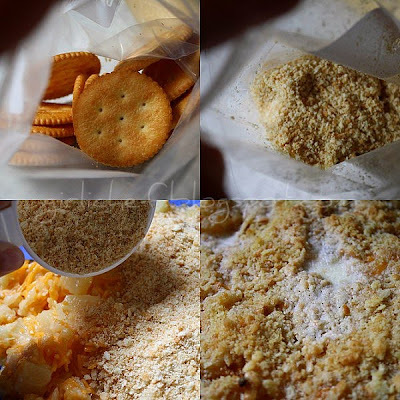 If you haven't yet smashed up your Ritz, do it now and then spread the cracker crumbs over the mixture and drizzle the melted butter over the top. Bake for ~30 minutes, or until golden. Tasty. Crazy weird...but, tasty. My favorite parts are the edges where the cheese and the pineapple have caramelized and you get those sticky, golden bits! Cheers Dani! Before you go...have a look at this.... ...yum, right!? Head on over to My Year on the Grill where I'm guest posting for Dave today (about that delicious mess) while he and his lady enjoy The Big Easy. Let's be weird....with creation, as long as the result is satisfying ;-) so why not? Breakfast like this messy creation would be perfect for my husband. I make something similiar to this.. a pineapple bread puddding tha is delish with say a baked ham. Anyway, love pineapple and Dani, so this must be tasty. Naughty, do tell. This recipe is crazy! I would never have thought to put pineapple in a casserole with CHEESE and RITZ CRACKERS on it. Strange. But also intriguing. If only I weren't allergic to pineapple...it used to be my favorite fruit but now when I eat it, my stomach hurts almost instantly. I believe it's because I ate it almost every day for a year and so I over-acidified my stomach. I guess too much of a good thing, really is bad for you! How interesting. Never thought to put pineapple in a casserole, let alone with cheese! Congratulations on your award! I might just have to try this. I really like pineapple and this does look very good. Congrats on the award! Wow, I have never seen cooking pineapple this way. Answer to the question 25, Missing Someone? > Me!! Dude, is this from the Motherlode book? Awesome! Clowns are evil, man. I totally agree. Girli, I've see a similar recipe and thought the same thing, went as far as buying the ingredients and then never carried through on it, LOL. I dunno, I think I'm going to have to take your word on this, grins. Love Target with the French pronunciation! 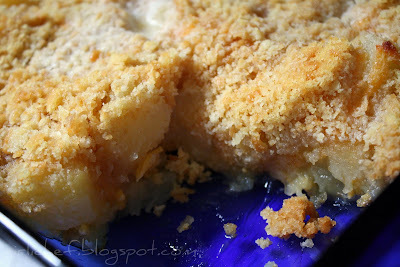 pineapple inside out cake/crumble - I can only eat canned pineapple as fresh makes my mouth itch - go figga! Cheese and pineapple. Now that's a combination I wouldn't have thought of. But those weird ones can suprise you. Thanks for guest blogging on A Year on the Grill's blog. My mother made something similar to this. It was tasty. KitchWitch...seems like it would be, right! Mother Moon...LOL!! I suppose so! Love it! Course, I love pineapple. Hm, if the edges are the best part, why not make it in ramekins? Tons of edges that way. Great photos and how to! I popped on over here from Dave's Year on the grill blog where you were a guest blogger! Dave really likes to party huh? Love it! Oooo...I have a fear of clowns, too. They creep the freak out of me!!! lol. Nice casserole. I love pineapples. I can eat them day in and day out. Fresh or canned. Yum!!! I'm so tempted to try this, but I know I'd have to eat it all by myself. And I need something to sub Cheddar (no Chedda here). Thanks a lot for thinking of me and passing me the award. 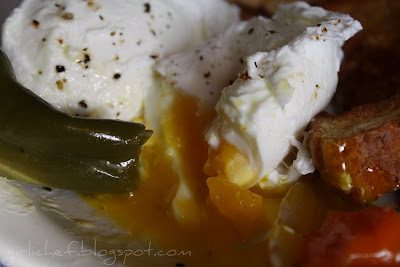 i love this, sweet and cheesy, a delicious breakfast! Congrats on the award and thanks for passing it on to me!! :) I'm so glad you tried the casserole. It's a hard one to wrap your head around until you think...pizza, where they put ham, cheese and pineapple on it. Anyways my mom says this is a great side with pork chops. You arr such a hilarious one! Danielle is too! I love messy breakfasts, and this looks over the top! Pineapples and cheese??? wow, that's new to me, really interesting. I have to try this out too! Super weird. Thankfully, I'm allergic to pineapple...yes, you heard right so...can't try it. Weird but exciting, how's that for a summary? This is a crazy recipe and sounds like something I would just love to try. It would make a wonderful side dish...great for Easter with Ham! Very unusual recipe but I do love canned pineapple and I think it would match with the salty cheese. Congratulations on your award. I'm seriously thinking about the recipe. Seriously :-). Have a great day. I adore pineapple, thrive in mess and will need to try this - it looks like so much fun! Congrats on the award - well-deserved! This looks really fabulous! Funny, I'm making a recipe for dinner that includes pineapple. The casserole looks...fascinating! Wow! I'd never imagine combining those ingredients together! I have not seen this recipe in a while--a vintage one that I had forgotten about! The sweet and salty is great together. Thanks for the recipe and beatiful photos! This casserole does sound strange! But I can see how it might work. I love canned pineapple! This dish might just find its way to my Thanksgiving table! Very Very unique and I can't wait to try it. You have to tell me how you answer questions with that gray box?? 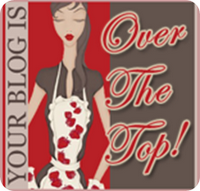 I swear the blog world is passing me by!! 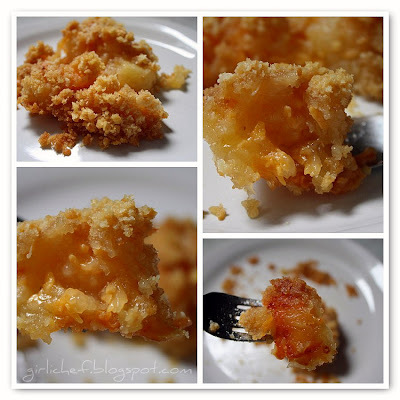 My husband would love this recipe, he likes anything pineapple. Holy cow! That is one crrrraaazy creation! I LOVE it! Pineapple with cheese? If there's Hawaiian pizza, why not? LOVE IT!!! Does seem weird, but then sometimes the weirdest combos turn out to be the most intriguing and yummy! This looks like it! What a cute set of questions and I love your one word answers. It's not easy to use only one word. As a challenge our writers group was instructed to write a six word memoir. My money is on you - I bet you could do it. I love the slightly burned (oops, caramelized) cheese edges too. It is such a treat to visit this site. Your photos and recipes always delight and amaze me...just sayin'. I love this! Definitely will make it for my daughter, she is sure to enjoy this! Great guest post over at Daves. I like the pickled jalapeno idea. Your meme here was cute too. I love pineapples-and now with a pineapple cutter,I'm always looking for fun recipes to make!! OMG Girlichef, I have been missing out ! Your place is AMAZING and your food is no different... 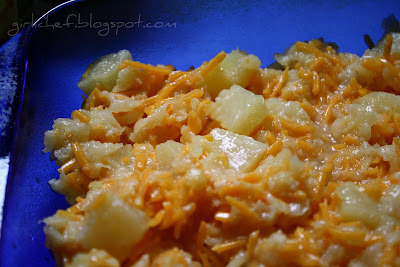 I LOVE the pinapple casserole ! Its unbelievable .... ! What an awesome dish! I would never have thought to make something like this but I bet it's delicious:) Congrats on your award! Awww... I absolutely love fresh pineapple...but this looks really good. And do you know what it reminds me of? That little glass jar of pineapple spread I put on Ritz when I was a kid. Do you know what I mean? I would totally eat this, though I don't know if I'd make it because no one but me would touch it. Maybe I could make a 1/4 of the recipe just to try it out. I love pineapple, so I'll bet I'd love this too. Love the pickled jalapeno post you did over at My Year on the Grill! And gorgeous pics as usual. I think it was great that you offered to guest post for him while he was off on vacation. Congratulations on your award - in fact, congratulations on all your recent ones that I saw on your previous posts but failed to mention! Ok Dani's Pineapple stuff still doesn't really look good to me... but I feel like I MUST try it now!